Sometimes simple, classic jewellery can be the most effective. 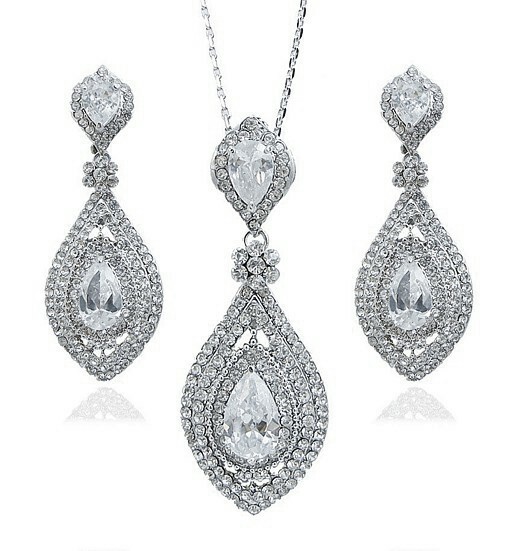 In this instance a stylised and utterly dazzling marquise-shaped cubic zirconia is set below a smaller shimmering marquise stone and above three rows of tiny shimmering CZs that sparkle like crazy with every tiny movement. The effect is multiplied in spades by the addition of the matching earrings. Truly stunning worn with a low-cut dress and sensational between the lapels of a black jacket or tuxedo. This is a Set that you will find yourself adding to any outfit for maximum compliments and a touch of joie de vivre! Set on a 925 Sterling Silver chain. 41 - 46cm (16-18") Size of pendant: 7.5cm (3") x 2.7cm (1") Earrings: 6cm (2¼") x 2.3cm (1") Silver finish. Crystal Clear Austrian crystal cubic zirconia.